What the hell is a yapok? The mystery creature is a marsupial. It is a New World species– an opossum. 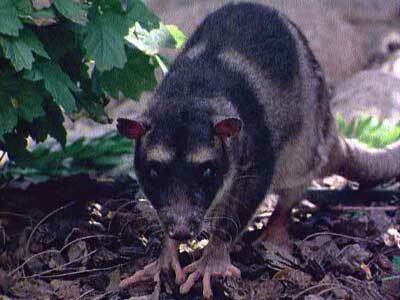 Opossums live in the Americas. This particular species is native to Central and South America. The name I prefer to use for it is yapok. But it is also called the water opossum. It has webbed hind feed and a long tail that assists in swimming. And its forelegs are used as feelers to catch fish and crustaceans. Once there was a wonderful video on youtube of a yapok swimming, but this clip has been taken down. It is sad, because that was a really informative video.